The complexity of the various forms of knowledge and practices that are encountered by teachers, university lecturers, teacher trainers, student teachers, policy makers and researchers, demands careful thought and reflection. Professional Knowledge in Music Teacher Education focuses on how knowledge is understood, what theories are held and the related assumptions that are made about teachers and learners, as well as how theory and practice can be understood, with useful and imaginative connections made between the two in music teacher education. Internationally renowned contributors address a number of fundamental questions designed to take the reader to the heart of current debates around knowledge, practice, professionalism, and learning and teaching in music as well as considering how all these elements are influenced by economic, cultural and social forces. The book demonstrates how research can inform pedagogical approaches in music teacher education; methods, courses and field experiences, and prepare teachers for diverse learners from a range of educational settings. 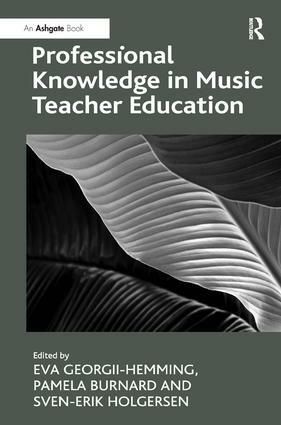 The book will appeal to those interested in the development of appropriate professional knowledge and pedagogic practices in music teacher education. Eva Georgii-Hemming is Professor Chair and Head of Musicology at the School of Music, Theatre and Art, Ã–rebro University, Sweden. She manages graduate courses in music education, philosophy and sociology of music. International publications and presentations include questions about the concept of knowledge, Bildung, informal learning, and the value and role of music in education as well as in people’s lives. Pamela Burnard is a Reader in Education at the University of Cambridge, UK where she manages Higher Degree courses in Arts, Creativity, Education and Culture (ACEC) and Educational Research. She is internationally known for her work in the areas of creative learning and teaching, and musical creativities in professional and educational practice. Sven-Erik Holgersen is Associate Professor in Music Education at Aarhus University, Department of Education, Copenhagen, where he manages master programmes in educational subjects. Holgersen teaches music education and research methodology at master and PhD levels, and his research is focused on early childhood music education and music teacher education.